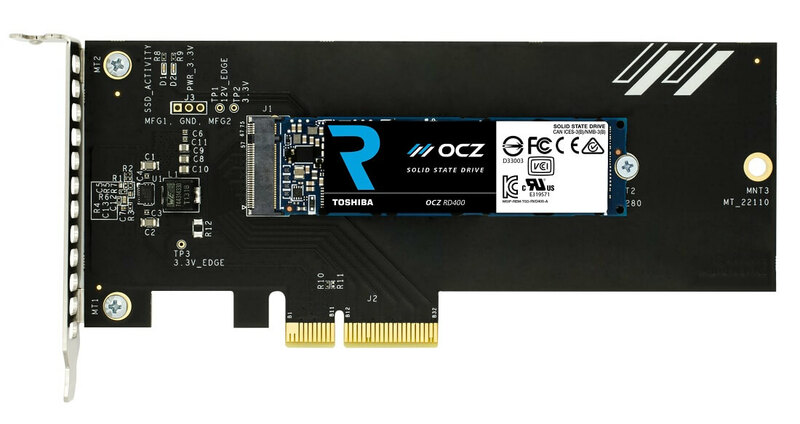 OCZ, now owned by Toshiba, has launched a collection of new PCIe NVMe solid state drives for enthusiasts, boasting fast performance and capacities ranging from 128 GB through to 1 TB. These new RD400 series drives use PCIe 3.0 x4 connectivity through an M.2 slot, although Toshiba will offer a bundle that includes a PCIe x4 to M.2 expansion card for those that have systems without any existing M.2 slots. As you'd expect from a modern enthusiast SSD, these drives use an NVMe interface for better performance and lower latency. The performance of these drives, particularly in read and write random IOPS, isn't as good as what Intel provides in their latest NVMe SSDs, however sequential performance is particularly impressive. The full specifications for each drive are below. Initial reviews are now also out. The prices for these drives place the RD400 in direct competition with the Samsung 950 Pro, although Samsung currently doesn't offer a 1 TB drive in an M.2 form factor, which gives OCZ an advantage here. If you're interested in buying one, they should be hitting stores shortly.